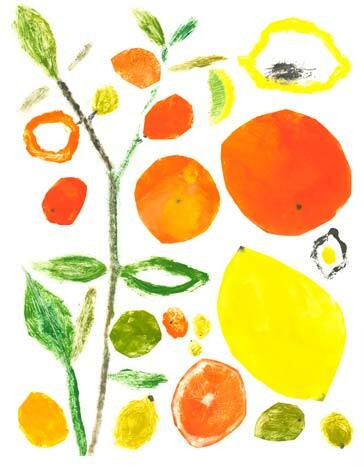 Inspired by many varieties of citrus. Recently I’ve been dabbling in printmaking which I studied many moons ago. Monotypes are original pieces of artwork in that you create a painting or collage on a flat surface (here I’ve used a piece of plexiglass) and print one-of-a-kind images on paper. Once the print is pressed on paper it can never be reproduced exactly the same again. The process is very freeing in that the final print always shifts from what I think it will be to the reality of the final piece. Getting back to this process has enabled me to let go of noodling tiny details and allowed me to appreciate the nuances of paint, texture and color and the ability to not get too attached to initial concepts but rather enjoy the process in a very spontaneous and intuitive way. This piece was Chosen by American Illustration 28. You are currently reading Follow Inspiration at donna ingemanson studio.